So we were talking the other day at work about how much we'd all like to belong to a recipe swap group, or something similar, and it occured to us that we can perfectly well do so here at work. Hence, for the next little while at least, Monday has been dubbed Recipe Swap Day. Today was our inaugral swap, and while many people forgot (:D), there was still enough food to go around :) The theme was Spring, because the weather here has FINALLY deigned to grow warm, and my contribution, thanks to the suggestion of my husband when I was bemoaning lack of time and energy to cook last night, was my Quick Asapargus Galette, something my husband and I invented a little while ago to use up asaparagus. It's yummy, and as promised, very quick; I knocked it together in 10 mins here at school during a free period, then threw it in the oven to bake while I did Other Important Stuff. Grated parmesan - a couple of tablespoons?? Spray a shallow, small, rectangular baking dish (about 20x30cm?) with non-stick, or grease it. Lay pastry sheet in dish so that about a quarter of it overhangs each long edge. Sprinkle liberally with parmesan and crumbled feta. Sprinkle over corn kernels. 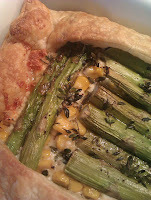 Tail the asparagus spears then lay them lengthwise on top of everything else so that they completely cover the available space. Sprinkle liberally with lemon thyme and season with a drizzle of olive oil and some salt and pepper. Fold the pastry in and pinch it closed at the ends to seal it. There should be a gap open down the middle where you can see some asaparagus; this is Good. Bake in a moderate to hot oven until pastry is browned, about 25 minutes. Serves two people as a light meal, or up to six as an accompaniment.